Here you will find a selection of audio files in English with Spanish translation and some mantras of participants singing, recorded during different retreats. You can listen by using the player on the right, or download the files as mp3s from the list below. 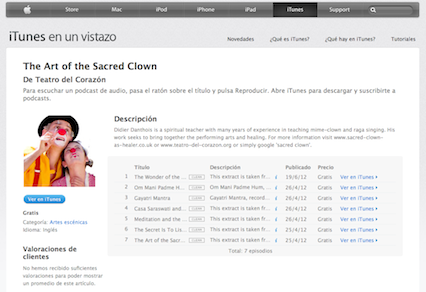 You can find us on iTunes or Podomatic by searching for podcast The Art of the Sacred Clown.